This is an anniversary blog, commemorating the first post to my weblog, almost a year ago, when on 20 July 2011 I decided it was time to write online about Ricketts. Some people anxiously told me they did not think that a weekly blog about Ricketts would survive for a year, due to lack of subjects. The opposite is what happened: the list of subjects I can write about is longer than ever, and I would like to thank Ton Leenhouts for his support and for his suggestion that I write about the patterned papers for the Vale Press books, a series of seven blogs that will be continued. Also, I am grateful to Marja Smolenaars for correcting my usual grammatical errors and typos. Looking back, I am particularly pleased with a contribution by Paul Delaney about Ricketts's mother and another one about the Burlington magazine by Barbara Pezzini. If you would like to write an article for this blog, please mail me, as the blog is intended for Ricketts scholars, Ricketts collectors, Ricketts enthousiasts, the 'Ricketts racket', as Paul Delaney once called us. In April, one hundred years ago, a new book of poems was published by Sands & Co. in London and Edinburgh, Poems of adoration, written by Michael Field. These belonged to 'the first fruits of our Catholic life' (*). The poet Gordon Bottomley admired the cover of their book. 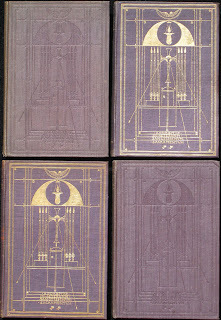 The binding design incorporated Christian symbols, such as the Holy Spirit (on top), a burning lamp, organ pipes on either side of a crucifix, and an altar. Underneath are the words 'Adoremus in aeternum sanctissimum sacramentum', while lines with dots, circled dots and two small leaves form an orderly rectangular pattern, which is broken by three diagonal lines symbolizing the stigmata. 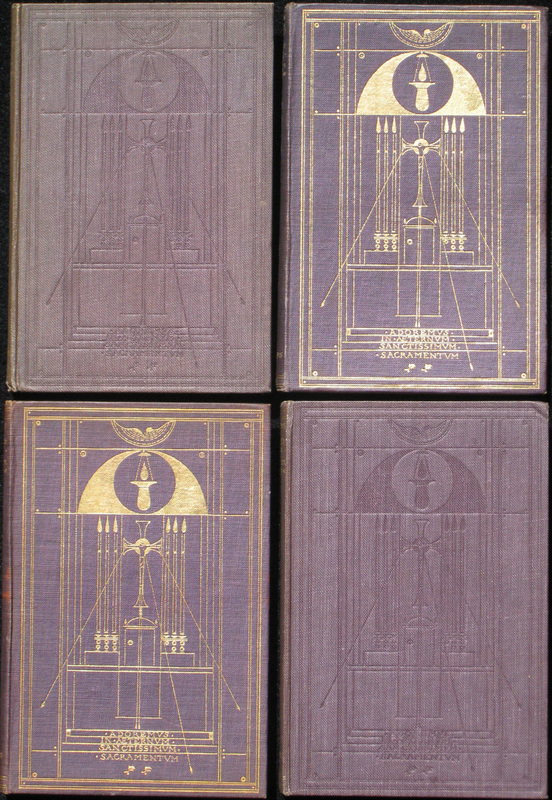 The design was blocked in gold on the upper cover and the spine was also printed in gold. However, there are also copies with the design blindstamped on the upper cover (the spine design still printed in gold), probably a secondary binding. Ricketts's own copy was exhibited in 1933 at the Royal Academy ('lent by the estate of Charles Shannon, Esq., R.A.') and that copy had the gold tooling on purple cloth which makes the design so brilliant and evocative. (*) Works and days. From the journal of Michael Field, 1933, p. 308.